Number one news source for stories where fashion meets conservation. Fashion for Conservation 2018 Highlights! From bringing a group of fashionistas into the heart of the Amazon rainforest for one wild annual FFC retreat with Hoja Nueva to raising one million pounds for grassroots conservation along side the Whitley Fund for Nature...here’s what bridging fashion with conservation looked like in 2018! On February 18th, FFC debuted their AW18 campaign to spotlight conservation efforts in the Amazon rainforest. Held at London’s Covent Garden, the event centered on the urgency of saving the world’s remaining rainforests, which have been in steep degradation as a result of climate change and the decline of wildlife species. Opening the show was guest designer Jatin Patel of Kalikas Armour with the exclusive womenswear collection entitled “Majestic Mystics”, fantastically inspired by the Amazon rainforest. Also featured was “Impermanent Flora”, part of the Re:ne(w) label by René Garza in collaboration with Magpies & Peacocks. This rainforest inspired avant-garde line was an amazing zero-waste collection, made entirely from end of bolt textiles and up-cycled clothing. Following the show was a Cocktails for Conservation afterparty, featuring keynote speeches and a live DJ set by the LALLAS. FFC would like to thank the dear sponsors who made this wonderful campaign, runway show, and afterparty all possible: the Whitley Fund for Nature, the United Nations, Fashion Scout, Magpies & Peacocks, Hoja Nueva, Snow Leopard Vodka, Elephant Gin, Fair Drinks, and Bar 135. FFC hosted their first annual retreat with Hoja Nueva, a non-profit eco-retreat working from deep within the beautiful and remote jungles of Peru. Led by amazing guides who lived and breathed the jungle, the eclectic group of 16 creatives, from models and photographers to artists and musicians, hiked up and down the stunning Peruvian landscapes, cooled down with swims in the stream, and learned to become one with nature’s raw beauty and energy. Throughout the retreat, focal points of Hoja Nueva’s work came to light and reminded us just how crucial and worthy the ongoing work of conservation is. The team visited/toured cacao farms in Madre De Dios, highlighting the need for sustainable and healthy revenue streams for indigenous populations as to not have them forced into engaging in harmful activities, such as deforestation and hunting for their livelihood. The team also met Max Bear, a baby Howler Monkey injured by illegal hunting in the Amazon, and stayed with a number of rescued animals. Despite such conservation lands being legally protected by the government, habitats are still destroyed and species are hurt and lost everyday. As such, Hoja Nueva gives their all into supporting both the environment and the populations residing in it. Cocktails for Conservation 2018 was held at the end of May at the Riveter in Seattle’s Capitol Hill neighborhood. The Amazon-themed cocktail party featured speeches by FFC’s very own Ava Holmes and Hoja Nueva’s founder, Samantha Zwicker. Highlighted during the night were works from FFC’s Elephantasia campaign as well as works by designers René Garza and Kalikas Armour. At the heart of the event was the concept of gathering individuals who share a deep sense of care and responsibility for conservation, sustainability, and are concerned with the ways in which fashion can be an industry through which invaluable change can be made. Proceeds from the event went to supporting Hoja Nueva’s conservation efforts in Peru. Those that came out to the party included local businesses Vann Edge Salon and Indi Chocolates—Thank you for the free beauty treatments and chocolate tasting at the event! FFC would like to also give a special thanks to our VIP partners: DJ Gradeay, the LALLAS, Blue Danube Productions, NOVICA, ALLÉL, Plate - Restaurant, Bar, & Bake, Endangered Species Chocolate, KIND, Crooked Beverage Co., GTS Kombucha, Snow Leopard Vodka, Elephant Gin, and Fair Spirits. The Ibiza Summer Presentation 2018 was held at Ibiza’s iconic summer resort, Atazaro Agrotourismo. The Atzaro Pop-Up featured photographer Rohit Chawla’s most famous work from his famous collections ‘FREE DA!’, ‘WANDERLUST’, and more. The art show also displayed pop ups from featured FFC brands and a fashion presentation by Alfonso Sanco. This year, FFC hosted its 4th Annual Rainforest Gala and Runway at Block 41 in Seattle’s Capitol Hill neighborhood. All the proceeds went towards protecting and conserving the rainforests. $12,000 was raised that will go toward expanding Hoja Nueva’s land by 150 acres to conserve rainforest habitat. Another $6,000 will go towards supporting the start of Project ReWild, which is a program that aims to rehabilitate and release threatened animals to the wild. The show was kicked off by a beautiful children’s collection by Polleras de Agus. The collection was hand sewn and embroidered skirts by women in Cusco, Peru. The show also featured a nature inspired menswear collection designed by Kelly Dawn Riot. Kalikas Armour designed gorgeous show stopping pieces for the runway. Also featured on the runway was Rene Garza’s zero waste collection, which was accompanied by Beyond Thread’s jewelry made from recycled shirts and materials. Local headliner Luly Yang finished the show with beautiful designs. Throughout the evening, Deseo Carmin performed numerous live performances for the guests. The gala also featured a silent art auction, the Hoja Nueva Store, Indi Chocolates Bean to Bar Tasting, Dom Gomez Live Fashion Illustrations, a tropical cocktail bar, and Kendra Scott Jewelry. FFC would like to thank our amazing sponsors who made the event successful: Block 41, Blue Danube Productions, Vann Edge, United nations, Baikalla Jewelry, Floral Image, NOVICA, Indi Chocolate, Eufora, GT’s Kombucha, Snow Leopard, FashionNXT, Kendra Scott, Frankie & Jo’s, Chocolate Krak, Simply Seattle, Lady Yum, Finnriver Farm & Cidery, the Snap Bar, TEDx Seattle, KIND, The Riveter, the Sock Monster, Global Spirits & Wine, Eat Seattle, Evergreens, Univision, Central Co-op, SANCA, SMG, Belltown Inn, Trader Joe’s, AVA, and Pike Place Fish Market. As the finale of 2018, FFC joined forces with the Whitley Fund for Nature, helping WFN raise one million pounds for conservation! With our combined efforts, we put together a sustainable runway show at the 25th anniversary ‘Hope Gala’ at the iconic London Natural Museum. The runway showcased beautiful and sustainably sourced collections by the wonderful designers, Mother of Pearl and Deborah Milner. Deborah Miner’s collection was inspired by the coral reefs in the Natural History Museum. Select pieces by both designers were curated for an auction. All proceeds went towards grassroots conservation alongside the Whitley Fund for Nature. We would like to give recognition to our amazing sponsors: AVEDA, the Cuckoo Club, The Library, Plate Restaurant & Bar, The Lost Explorer, Weleda, Embargo, Real Remedies, No 1 Botanicals, Dr Rita Rakus, Cohorted, Eco Glitter Fun, Emily Fruit Crisps, Compassion in World Farming, and British Fashion Council. Will you join the movement to bridge fashion with conservation in the new year? - Volunteer at one of our campaigns or fundraising events: get in touch directly if your a guru in the areas of marketing, organization, design, production, Gung-ho conservationist with a willingness to learn to do whatever it takes to run successful conservation campaigns thrift fashion. I'm incredibly excited to join forces with Fashion For Conservation. The creativity, people involved and purpose behind the organisation inspires me. I'm looking forward to raising awareness and supporting important issues in conservation. I had the pleasure of getting to know the team after being sat next to lead designer, René Garza Front Row at Elephantasia for London Fashion Week. It was a breathtakingly beautiful runway show and the stars must have aligned because it's lead me to this moment where I'll now be actively collaborating to create content over the next few weeks and months. Upcoming, 'Artists For Conservation' is a concept inspired by my passion for conscious art, nature and all that Fashion For Conservation are doing. We need to draw attention to important issues and I hope to be an advocate for how fashion and other artistic industries can put ethics at the backbone of their work to create in a way that protects future generations of ecosystems and wildlife. Artists have such power to initiate change by opening up a conversation. If we bring our voices together, we can create a message and impact on what matters. Nature inspires me on so many levels. My debut EP, COCOON uses natural metaphor to express themes of change within a person and themes of breaking out of fear to become your most authentic self. The process can be painful but ultimately healing as it allows you to evolve and evolution is a constant cycle. I found using the concept of the butterfly and metamorphosis more potent than to indulge in speaking about myself directly in these tracks. I have more music coming this year, including a re-imagiantion of Bowie's Man Who Sold The World, which I recently performed on BBC introducing, I look forward to sharing many more tracks with you soon. Elle L joins the FFC team for a special collaboration. Each month she will be curating a new monthly 'artist' feature. Seeking inspirational conscious artists in the world of Fashion, Music, Beauty, Food & more, Elle L will be discussing how sustainability and nature can be a driving force of creativity and how we can make art without affecting animals and the ecosystems of our world to create a sustainable environment. 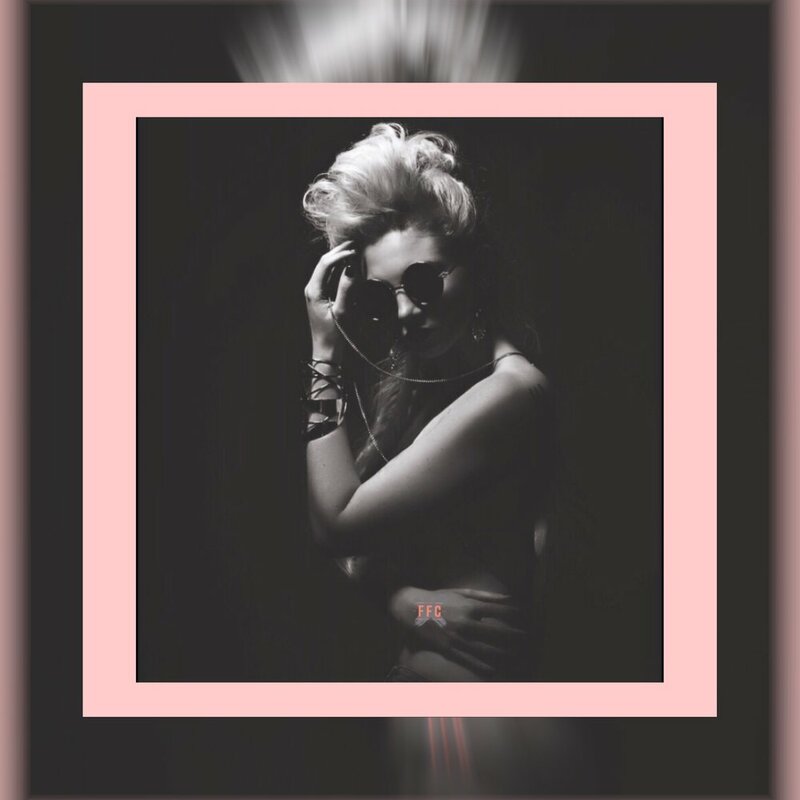 Described as 'One to watch Now and Beyond' by the likes of CLASH magazine - 360 music artist, model, director & writer, Elle L has had works published on CNN international as a writer as well as been part of her own show on the network. She has also worked on Emmy nominated documentary for the IFC and BBC, directed for Copenhagen Fashion Week and as a model has walked for London Fashion Week. Most recently her focus has rooted itself in music, the medium she resonates to the most. 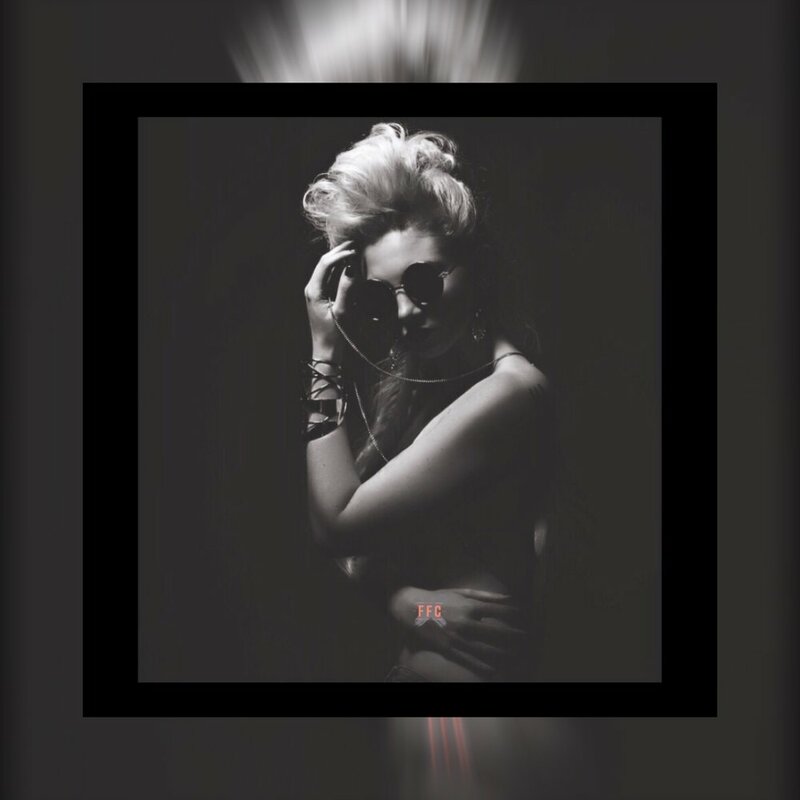 Elle L has received worldwide press on her first single, been featured on BBC introducing and her second single, CIRCLES is the new sound of Lacoste Pour Femme. Elle L represents a new-wave of millennial artists that allow expression to be manifested in a variety of channels, her alignment brings out this energy to find the world's most conscious creators so we can get everyone talking about topics that matter. This weekend, Elle L will be interviewing FFC lead designer, René Garza in the lead up to Fashion for Conservation's debut of a campaign to save the Amazon rainforest at London Fashion Week in Covent Garden's Freemasons' Hall venue, February 18th 2018. Stay tuned! If you're shopping for your last minute gifts this season, don't miss out on these 5! Gift your loved ones a fashion forward new year while contributing to a healthier, happier planet in 2018. And if you're reading this closely...we would like to gift YOU with 10% off your entire purchase. Enter FASHIONFORWARD10 at checkout. Your gift funds conservation; 30% of each sale supports the African Wildlife Foundation. Happy Holidays from your Fashion for Conservation family! 1. LOVE ME by NO VOICE. Elephantasia limited edition. NO VOICE X Elephantasia is originally designed and produced by artistic and romantic partners Oscar Abbots - international designer for brands like Roberto Cavalli, Josep Font, Adolfo Dominguez and currently Zara - and Riccardo Ceretti - artist and archeologist with an innate passion for fashion. They live between Italy and Spain where they "seduce all creative fields like music, film, architecture and art to reflect them in the wonderful world of fashion." 2. Fashion fighting for Conservation custom bracelet. Only 24 made. Available for custom printing! A little bit Renaissance a little bit rock and roll. Squirrel Vs. Coyote brings contemporary fashion with bold accessories for fearless champions of uniquity. Available for custom printing! Only 24 made. Available for custom printing! 3. Elephant and monkey scarf. Elephantasia limited edition. Vismaya hand weaves a variety of breathtaking shawls, scarves and wraps. This Elephantasia limited edition is hand made from 90% modal, 10% Cashmere, and non-toxic dies. Ever since its inception, Vismaya’s accessory collections have quickly become a renowned label across the globe. The brand offers seasonal collections of gorgeous accessories in vibrant colors, exquisite patterns, and sumptuous fabrics including silk, linen, wool, cotton, cashmere, modal and a variety of blends. The artwork depicted on this specific scarf is by Colette Miller, founder of the Global Angel Wings Project, founded first in the streets of LA. Colette paints angel wings that are human-sized, interactive public art, and she has since painted wings globally in Kenya, Australia, Taiwan, France, Cuba, Mexico, and many US states. 4. Tusked silhouette jumpsuit and dress. Elephantasia limited edition. **This is a custom item, please send us your measurements with your order. 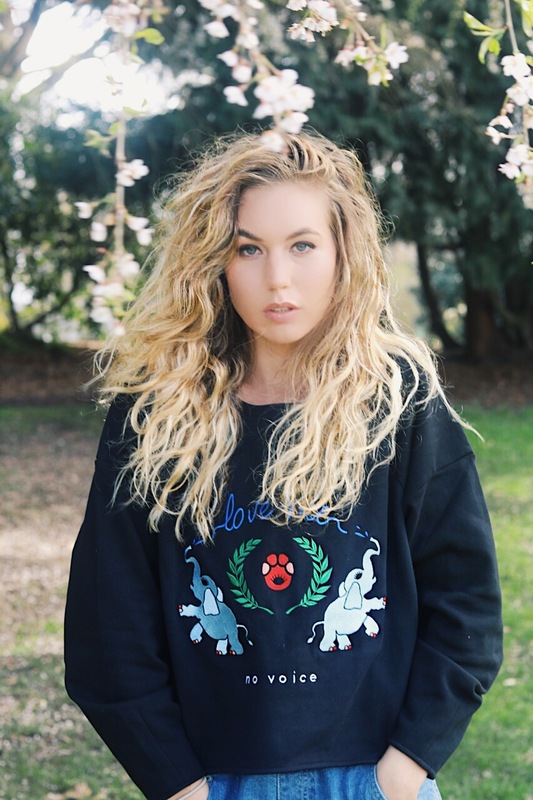 "We at Rachel Allan support Elephantasia because we want to help bring awareness to the many issues surrounding and effecting elephants, such as being poached for their ivory tusks or losing large amounts of their habitats due to human expansion." **This is a custom ordered item, please send us sizes with your purchase. 5. Fashion for Conservation Membership. The gift that keeps giving! Complimentary copy of Fashion for Conservation Magazine: full color luxury print publication designed and directed by the art director behind "100 Years of Vogue." VIP Golden Ticket to Fashion for Conservation shows at Paris Fashion Week Fall/Winter 2018 and New York Fashion Week Spring/Summer 2019. Limited edition elephant print gifted from South African/Kenyan wildlife photographer Chantelle Melzer valued at $280 US dollars. Invitation to exclusive member-only events and experiences upcoming in New York, Seattle, LA, London, Ibiza, Berlin and Cape town. 100% of your donation goes to African Wildlife Foundation (AWF). Tax-deductible receipt matching your donation amount. 100% of your donation goes to African Wildlife Foundation (AWF). NO VOICE Bomber (made with recycled plastic bottle fabric). NO VOICE Hoodie. Elephantasia limited edition. Thank you to all who came out to celebrate with us this Giving Tuesday 2017 (November 28th every year) Here is the official recap, cheers! The Cocktails for Conservation themed drink menu set the tone for an unforgettable evening of cocktails, fashion and conservation with local and organic drinks provided by Finn River Farms, Kerloo Cellars, and GT's Kombucha, and passed hors d'oeuvres by Ravishing Radish catering. Cocktails for Conservation featured "Forest Floral" and "Black Jaguar Bitters" speciality cocktails hand-crafted with herbal infused 7 Par Vodka by Aubrey Koch of Rootkin Remedy. VIP guests received their glasses and goodie bags before being ushered to their front row seats before the show. Over a dozen guests live stream the event. Yuliya Suleymanova put particular attention and efforts into ensuring her followers and fans at SULEY GROUP saw the show through her lense. 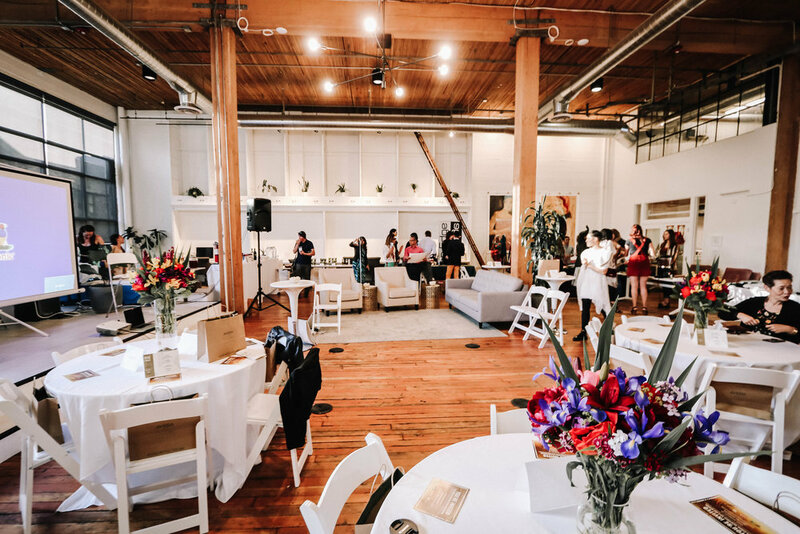 Fashion for Conservation's Elephantasia SS18 campaign featured one last time this year for an intimate audience of 150 special guests in Seattle's Axis Pioneer square Tuesday evening. Models flaunt their looks in the photo-booth courtesy of Shutterbus after the show. Raven, Sabrina and Sage model Elephantasia designs by J. Von Stratton, René Garza, and Meredith Allen. A marketplace of pop-up shops invited guests to shop from brands that give back the planet: Aveda Vann Edge Salon, Indi Chocolates, Coyote and Squirrel custom Jewelry, Axis space artists, and the two hosting organizations: Fashion for Conservation and Hoja Nueva. Event staff pose for a team photo. Left to Right: Vilte Rooney, Vance Ashworth, Meiko Parton and Samantha Zwicker. Makeup artists' and hair prepare for metamorphosing the models and staff for showtime. Rose Prado of Vann Edge Aveda salon applies the final styling touch to each Elephantasia model. 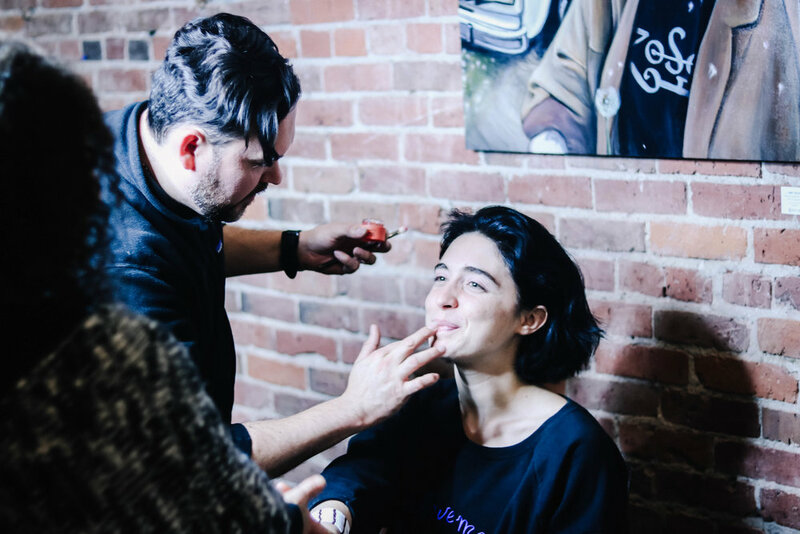 Makeup artist Leo applies foundation on event producer Ava Holmes (wearing Fashion for Conservation NO VOICE hoodie). Executive Producer Ava Holmes and Creative Director Nazanine Afshar thank the event sponsors and volunteers. To close the show, Dawnamatrix designs six beautiful butterfly inspired wearable art pieces previewing next year's Rainforest Gala with Hoja Nueva. A huge thank you to KIND bar and GT's Synergy Kombucha for sponsoring this event and supporting our conservation efforts. We so appreciate your contributions and helping make our events so enjoyable for our guests! Cocktails for Conservation supports rainforest conservation efforts with Seattle and Peruvian amazon based charity Hoja Nueva. We hope everyone that attended the event was inspired in all things fashion and conservation! "Strong, gentle, elegant, graceful, and beautiful. Words thxcat describe elephants are synonymous with our label. We take inspiration from their kindness and wisdom to produce sustainable fashion for a world we must share with these magnificent animals and the natural world." -Gabriela Rose (read bio here). We are excited to share this new interview with the founding team of FFC, conducted by our LFW SS18 venue partner for Elephantasia, Fashion Scout London.
" Activist fashion design group Fashion For Conservation present Elephantasia, a unique group that combines rights and conservation for animals with the fashion industry. Elephantasia creates unique couture interpretations of the elephant, bringing awareness to our LFW audience on the extremity of the poaching crisis. With the heartbreaking fact that 96 elephants are killed each day for their ivory, FFC wants to send vital messages to Fashion Scout attendees about how important individual consumer choices matter to our world. We are intrigued by the concepts behind Elephantasia, and wanted to have a chat with the FFC team to find out more about their unique, artistic conservational project. Elephantasia showcases 24 designers from 24 unique countries around the globe. Each have their own history of why they became a designer and what inspired them to be a part of this campaign. Find out here. As for how design became a part of our mission here at Fashion for Conservation (FFC), we suppose it was the world from which “one and a half” of our founders come…Nazanine Afshar is a creative director for major publications such as Vogue, Italian Vogue, Elle, Marie Claire and Allure; Samantha Zwicker is a wildlife conservationist and executive director at the Peruvian Amazon based non-profit Hoja Nueva; and finally Ava J. Holmes, connecting both industries as a former producer for fashion weeks worldwide, wildlife enthusiast and current reality TV show wilderness survivalist with Discovery Channel. WHAT DO YOU HOPE TO COMMUNICATE THROUGH YOUR CLOTHING? "Today, it is not enough to just create pretty fashion campaigns and couture collections. As advocates of the arts, we have the responsibility to use the power of fashion branding and the available media outlets to spread important messages and to promote causes around the world that have a direct effect on the future of our planet! Today, our message is preservation and protection of one of the most beautiful animals in the world: the majestic and beautiful elephant! Why? Because they are crucial to the health of our global ecosystem and the survival of our planet. DO YOU THINK THE FASHION INDUSTRY IS CHANGING AT THE MOMENT? Yes. The industry is always changing it’s just that we now have to be more careful than ever as to how we allow change to happen. We see retail giants adopting fast fashion more and more into our culture which is not only wiping out the support for independent designers but wiping out entire species of wildlife on earth. Today, according to the IUCN REDLIST “nearly one-third of species are globally threatened or extinct.” Fashion is largely to blame. That is why we are here to help steer the industry towards being a part of the solution to its own problem. As participants—if you wear clothes at all—this is in fact all of our problem. HOW DO YOU THINK THAT LONDON FASHION WEEK IS DIFFERENT TO OTHER FASHION WEEKS AROUND THE WORLD? It’s a hub of people passionate about innovation, a perfect petri dish for what we are trying to do here bridging the gap (or perhaps in a new way “minding” the gap) between fashion and each of our responsibility today to protect wildlife and the environment. FFC Elephantasia’s emphasis on encouraging ethical tourism and entertainment is only a small fraction of why they are working closely to make changes to the fashion industry; which has a direct impact on our planets future. Fast fashion is proving to be wiping out endangered species, minimalizing the beauty and culture we get to share globally. Elephants, being one of the most ancient animals to live, and being a huge part of African and Asian culture, it is crucial to share the growing importance of sustainability and using alternatives that save the world. Elephant conservation has always been near and dear to my heart. How could it not be? These majestic and intelligent creatures are so special and nurturing and a lot like human beings. More like humans than most understand. Did you know that elephants have memories like human beings? Elephants actually visit the graves of their dead family members just like humans do. They remember the happy experiences, as well the heartbreaking tragedies they endure. Like for example the witnessing of the slaughter of their herd/family members for their tusks by greedy poachers. These beautiful giants carry these haunting and brutal memories with them for a lifetime. It is a tragedy that any living creature would be subjected to this. Did you know that if it isn't stopped now, elephants will be extinct in our lifetime? This fact is crushing to me. So when Fashion for Conservation invited me to create a dress for Elephantasia and for my brand GYPSETGIRL to join them in their crusade to spread awareness and raise money for elephant conservation, I jumped at the chance. The launch of this seasons Elephantasia showcase was in Ibiza on July 18th at the Atzaró Fashion Festival 2017. It was a magical evening, full of uber bohemian style, a fabulous fashion show, pop-up-shops and most importantly recognition of the plight of African elephants. There's so much to share, I don't even know where to start! The night began with the arrival of the 2000 breathtaking international glitterati that some like myself, came all the way to Ibiza just for this extraordinary event. The cocktails flowed as people walked and danced around the property exploring the amazing food to sample and the boho-luxe wares each vendor had to offer their enthusiastic buyers. As the sun set, drawing a kaleidoscope of pink and orange in the sky the show began to the sound of a flute with what seemed like pixies coming from out of a forest. I was soon to discover that these "pixies' are some of the gorgeous members of the internationally known World Family Ibiza. A nomadic group of glamorous gypsies who travel the world to design and sell their incredible fashion collections (I couldn't resist taking a few of their colorful and luxurious pieces back home with me.). As the World Family Ibiza members left the runway, their designs soon followed in colors and textures that took my breath away! The most amazing part of the show for me of course, was seeing all of the mega-talented designers looks that were all elephant inspired for Elephantasia. They were very unique in style, striking and exceptional in their own right. 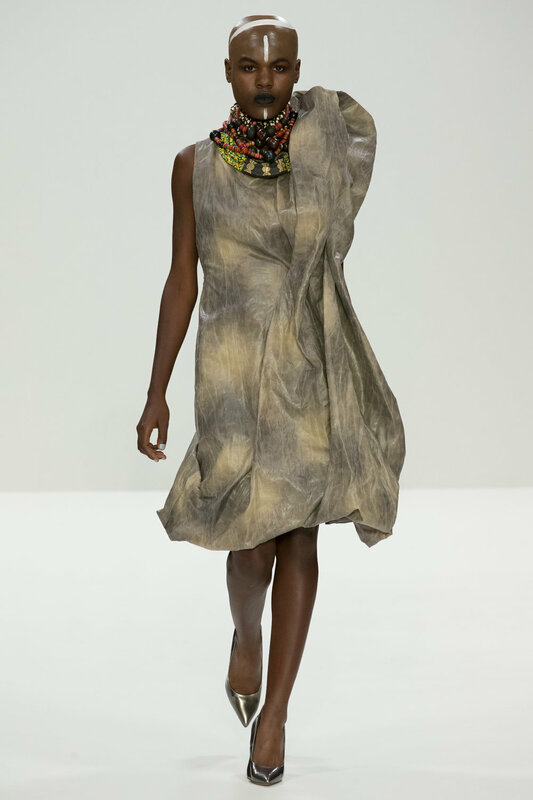 I truly can say that as I watched each look come down the runway, I really loved how through fabric and design each piece embraced the spirit of the African elephant in such an artistic way. Fashion for Conservation Co-Founder Ava J. Holmes thanking the audience for an Elephantastic opening night! Closing this absolutely fantastic show was the legendary Scottish designer Pam Hogg. Known for her eclectic designs, Hogg has dressed rock stars and celebrities alike, including Blondie, the Cult and Naomi Campbell. Her newest collection did not disappoint any of us expecting to see all of the edgy vibe that drips from her designs. What an amazing experience the whole evening was! I feel so privileged to have had this opportunity and to be included with so many other designers that I find so inspiring. I hope that you feel inspired as well. We all share this planet together, even though in some cases our countries have borders that are separated by oceans. Nonetheless, we all need the elephants to keep this world turning. African and Asian alike, and they need us to save their lives. So please do what you can to help support Fashion for Conservation and all the organizations working to prevent extinction and to save all the worlds beautiful and much needed creatures. Fashion for Conservation (FFC) is just the combination Seattle culture needed. Combining a love for animal rights and conservation with the innovative eye of fashion is so unique, as is the FFC team. Everyone dedicates time and effort into making the company what it is today, and everyone has a role. The talent and motivations of all teams within FFC strive to play to their strengths and constantly support each other to reach new milestones. The Fashion for Conservation team has hopes of obtaining a physical presence in 6 countries by the end of 2017. The current events have been hosted in the United States, United Kingdom, and British Columbia. Another goal is to boost the social media presence of FFC in order to secure a higher position in the world of invigorating fashion. Ideally, conservation inspired fashion will be a staple in the future, and will become a well-known concept to much more expanded audience. Pictured: Runway to Peru fashion show. Represents the future global expansion of FFC influence. Pictured: Members of the FFC team strategizing behind the scenes of Runway to Peru. Current ways to stay updated with FFC efforts and events is through our blog and social media, encouraging individuals to attend global events, shop the wildlife inspired online store, or make direct donations. Raising conservation awareness in itself is not an easy task, for this combination of industries is also educational for those less aware of animal welfare issues worldwide. FFC’s unique approach and lack of normality connects individuals in the world of fashion, film, and the arts to current real-world issues. In addition to producing creative pieces with the courtesy of sponsored designers, FFC educates consumers on animals and ecosystems and how to prioritize the purchasing of more sustainable clothing options. The actual fashion behind the eco-fashion shows are not as literal as one may think. Instead, pieces represent the idea of animals through colors and textures. Elephantasia, for instance, is a current campaign of FFC’s in 2017. A portion of sales go to the conservation of elephants and the quality of elephant sanctuaries. Elephantasia will be promoted on FFC’s upcoming European tour, complete with fashion shows to showcase the elephant inspired apparel. Elephantasia will be hitting the runways of Europe as soon as July 18th at Ibiza Fashion Week and ending with a bang at London Fashion Week SS18. FFC brings awareness to the importance of wildlife conservation. Overall, Fashion for Conservation will grow and evolve in the Seattle community as well as globally through increased engagement and people believing in the cause. With a determined team working together to bring out inspiring content and increased awareness of animal conservation, FFC will become an essential piece to the fashion industry. A-DOT Productions, Chantelle Melzer, Eco Fashion Week, DeCarbon Azul, Essentials Bakery, Evergreens Salad, Floral Image, Unclebob Studios, NOVICA, KIND Snacks, Roaming Elephant, SELEUŠS Chocolates, & Straight Jacket Studios. Reveal of The NO VOICE Collective founded by Oscar Abades (Spain) and Ricardo Ceretti (Italy). Elephantasia live exhibition featuring all SS17 designers including Shriti Pratap (India) pictured above. Elephantasia member appreciation with gifts from SELEUŠS Chocolates. Live painting and life-sized "Roaming Elephant" mural by Matt Shapira. Open bar of organic wine, cocktails and hors d'oeuvres. Donor and VIP appreciation with elephant gifts from the African Wildlife Foundation. Thank you from the entire team for supporting Elephantasia SS17! Thank you for making a commitment to protecting elephants! Life sized "elephant contract" signed by VIP of Elephantasia SS17 & Members Elephantasia.